We invite you to advertise in our monthly newsletter, The eDigest. Click here to view a sample newsletter. Click here for advertising rates and other information. The APA will soon be offering advertising on its website. The Arizona Paralegal Association also encourages sponsorship. For more information on how you can become a sponsor of the APA, visit our Sponsor page. 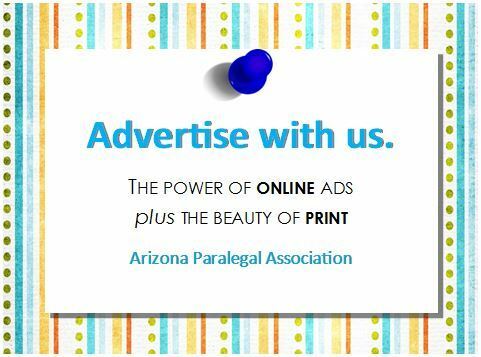 Companies who take advantage of advertising or sponsorship opportunities provided by the Arizona Paralegal Association will reach an upscale market of professionals.